Whenever we’re travelling in Europe we always try and stay in the older parts of a town or city as we love the character and charm of the old streets and buildings. Our Munich hotel, the Platzl (which deserves a post of its own so will tell you more then) is at the end of Sparkassenstrasse, just a couple of minutes walk from the Marienplatz. Straight down the road from the Platzl, we found ourselves at the entrance to the Viktualienmarkt (victuals market). The colours of the pretty stalls, not to mention the assortment of delicious produce, brightened up a rather dull Munich morning when we went in search of some souvenirs. If you’re coming from the direction of the Marienplatz you’ll find the markets behind St Peter’s Church. You can spot it from a distance by following the distinctive maypole in the centre of the market. 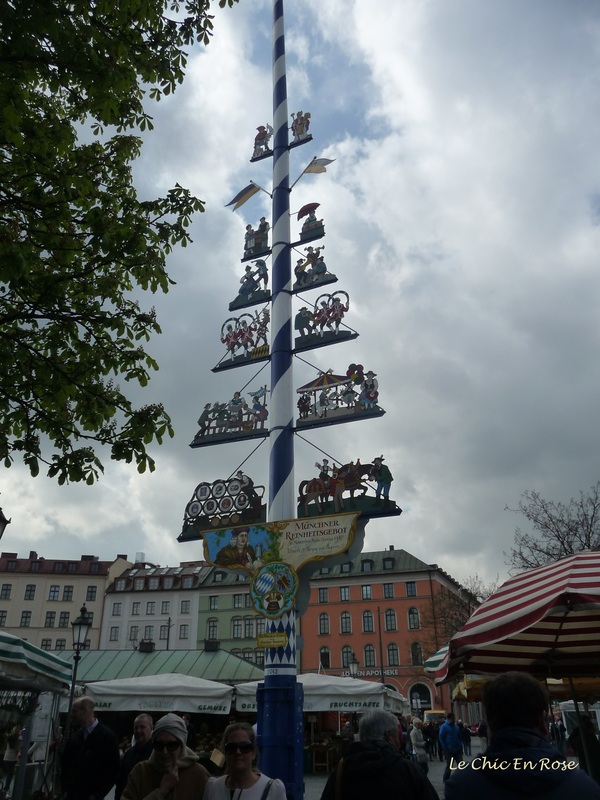 The maypole displays figurettes of the trades and crafts in this part of Bavaria. Originally the Viktualienmarkt, which dates back to the Middle Ages, was held in the nearby Marienplatz (main town square). However by 1807 it had become so big that King Maximilian 1 issued a decree to have it moved a little further south east to its present location (just a stone’s throw from the Marienplatz though). There are now about 140 stalls, which sell the most delicious looking local produce from fruits, vegetables, cold meats to luxurious looking chocolates and all manner of condiments! Fresh flowers, wines, beers and pretty ornaments and decorations – you will find a great array of things here! 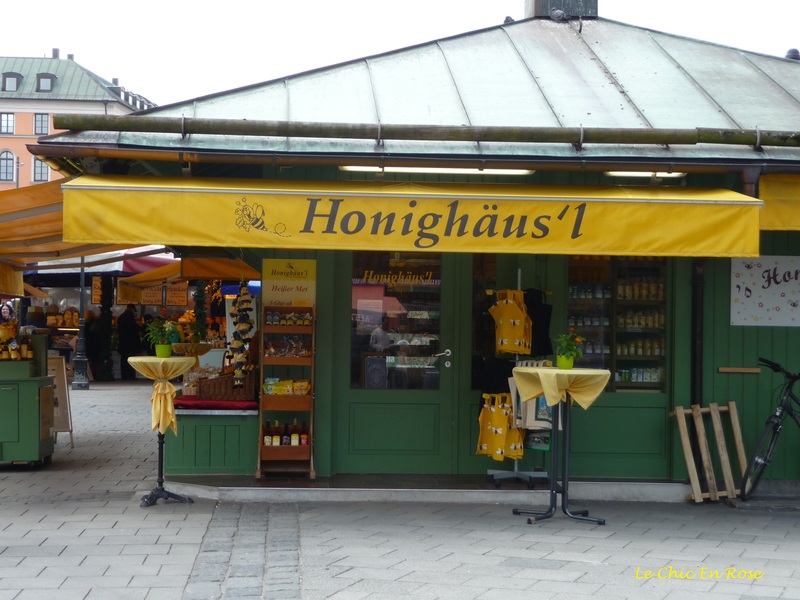 We loved the idea of the Honighaus, even the name sounds delicious, and debated long and hard whether to risk taking some honey back home to Australia with us. However the thought of a mishap with a jar of honey on a long plane trip was too awful to contemplate and we didn’t fancy lengthy explanations to Australian customs officials either, so sadly had to give it a miss. 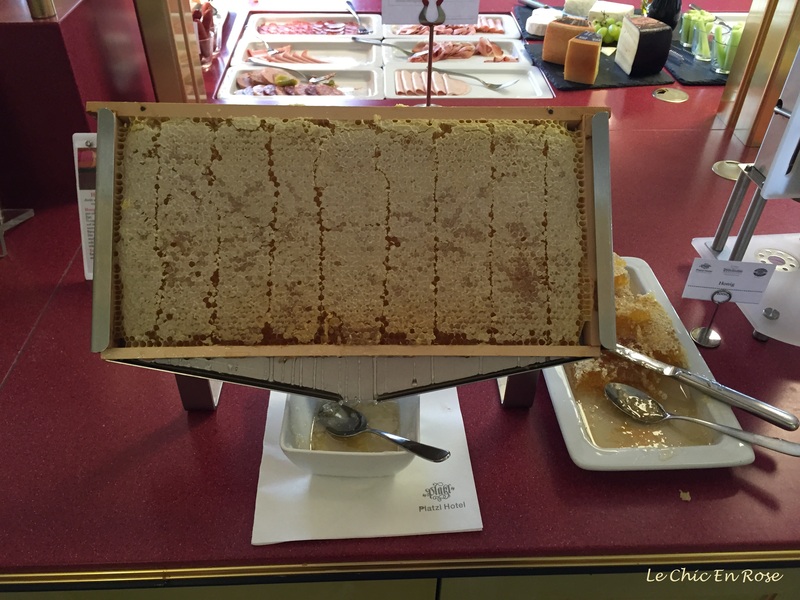 Monsieur Le Chic particularly enjoyed the fresh honey cut from a honeycomb every morning at the Platzl breakfast buffet, which the chef probably got from the market just down the road! Fortunately a little further on, we found a lovely stall selling all manner of chocolates, sweets and nougat so made some purchases here! Monsieur Le Chic loved the idea of the beer glasses filled with orange lollies and topped with marshmallows for froth – they did look quite realistic. In the end Monsieur settled on a miniature one to bring home. Beer glass filled sweet treats at the Viktualienmarkt! If we had been staying in an apartment in central Munich rather than a hotel, we would have bought a lot of our daily produce from the markets. The range and quality looked excellent. The Viktualienmarkt opens Monday to Fridays from 10 am to 6 pm and on Saturdays from 10 am to 3 pm. It is closed on Sundays. 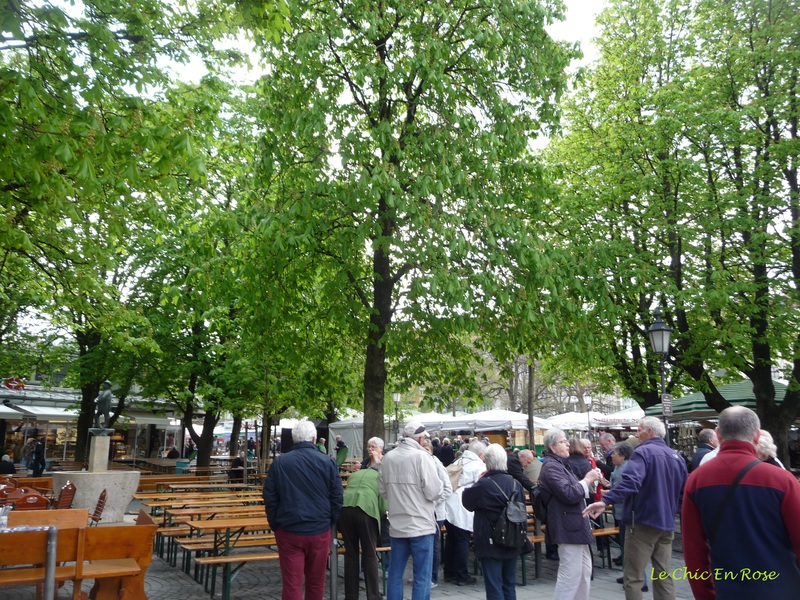 There is also a beer garden set amongst the cobbled stones of the market, which is a popular meeting spot and a good place to sample some of the local Bavarian fayre. The beer garden opens each day, except Sundays, from 9 am to 10 pm. Adjacent are a number of stalls and fast food outlets selling typical Bavarian dishes such as ubiquitous “Wurst” (Sausage) or Schweinebraten (roast pork). We had a wonderful time wandering round the Viktualienmarkt at a leisurely pace and browsing through the various stalls. If you enjoy exploring markets, the Viktualienmarkt is a must do in Munich! I love buying fresh food at the market as well, but unfortunately, when you have a long flight ahead, it may not be the best souvenirs ever ! That is sound advice. Much better to stay in the centre than in a modern corporate hotel. I think so Andrew – there are lots of hotels round the Munich Hauptbahnhof area and we could have easily picked one of those. Am so glad we didn’t as it would have been a good 20 minute walk to the Marienplatz and old town centre from there and really you could have been staying anywhere in Europe plus it was nowhere near as nice as the old town centre. Altstadts are the way to go in my book! I could just wander around a market like that all day Rosemary – the range and colours are incredible. Love the look of the beer glass lollies too – think we would have left with one as well! Good tip on the hotel, anywhere that has honey served like that is pretty special. We went to the Christmas markets in Munich and Nuremberg a couple of times before our son was born (can’t remember if we made it to the Viktualienmarkt but definitely one for the future) and had a great time Rosemary – the Gluhwein is absolutely recommended to keep the cold at bay!! Hope your weekend is a great one too!! Going to this sort of market is always a treat, no matter what city, in what country! So much color and beauty! 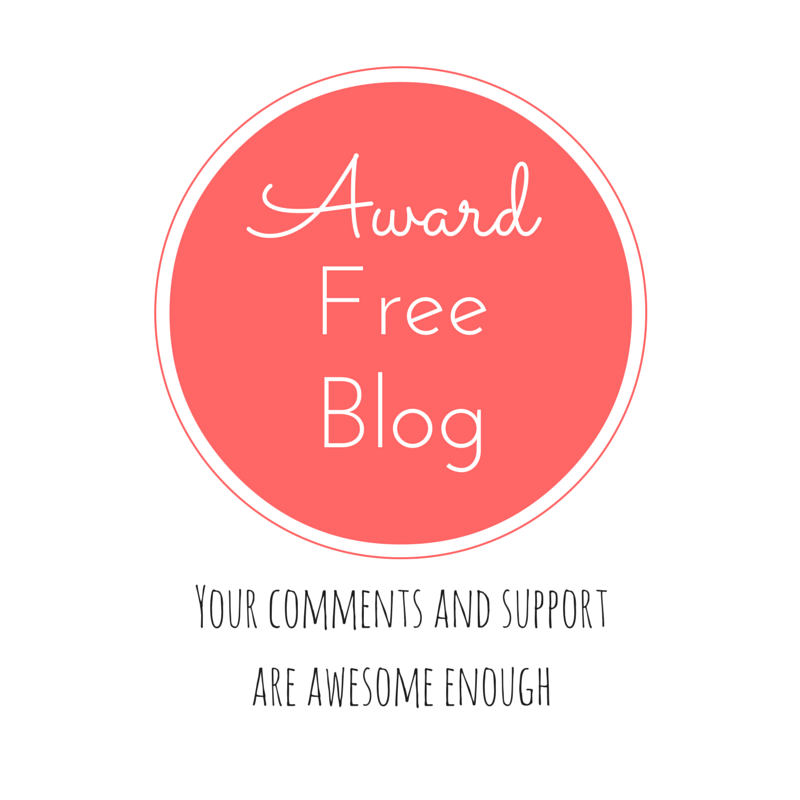 You made me miss Munich 🙂 Such a lovely post! Markets are always a place full of life. I’m glad you had a great time. Many hugs! I do love a good food market, and I think the German’s do the best around Europe, particularly around Christmas! But I love all the wonderful produce on offer as you lovely photos show. The honey looks wonderful, but can fully understand why you didn’t want to risk taking any back! I’d love to see the German Christmas markets one year – they must be amazing! I just had visions of honey everywhere not pleasant when you’re travelling!!! Like the look of that! It’s a lovely way to spend some time isn’t it? There will be lots of wonderful markets for you to visit in France! I love browsing I find it relaxing though Monsieur is not so keen – he did like the Viktualienmarkt though! Mt Reno man only interested if markets carry old tools, cameras , watches or Hifi equipment!! We visited there a couple years ago. Thank you for bringing back the wonderful memory. I also like to explore the old part of the cities (for the history) and the markets (for the daily life). The beer glasses look lovely, such a fun idea! It is good you could enjoy Munich after the flu… it is so annoying to be sick while traveling! What a ‘picture perfect’ market Rosemary! Crisp, clean, symmetrical, colorful and best of all, yummy looking. I could have spent hours hanging out their. The maypole is gorgeous too!